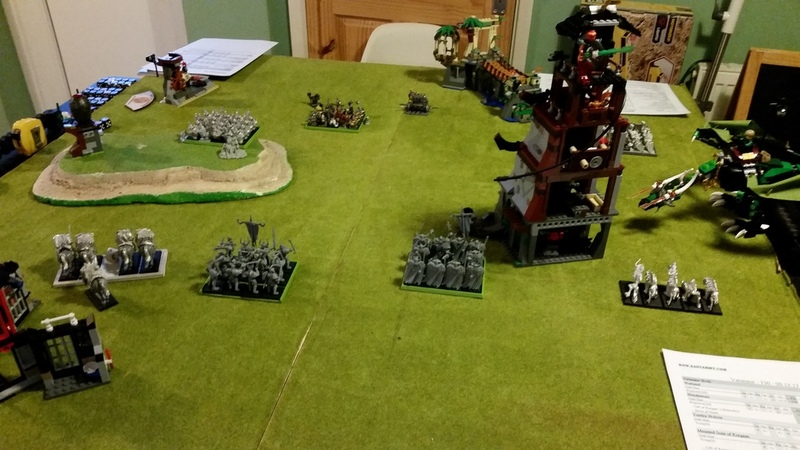 Greetings Wargamers and Hobbyists, and welcome to my second article on this topic. 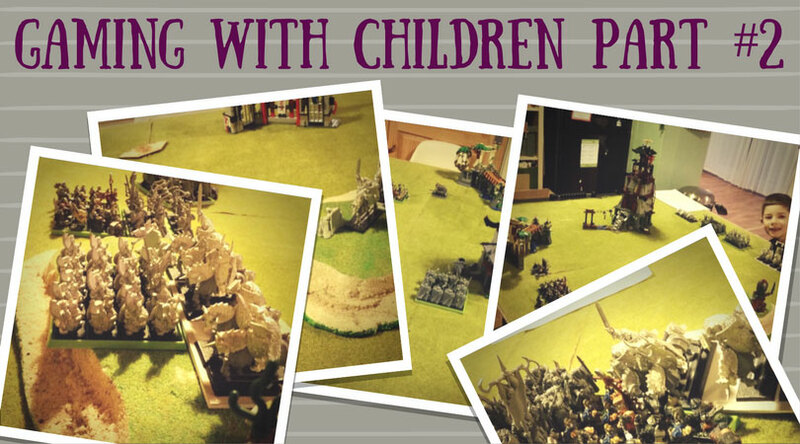 In the last article, I talked about what it can be like playing miniature wargames with younger players. I covered my approach to making games accessible to younger gamers, and about ways of engaging them and keeping their interest. 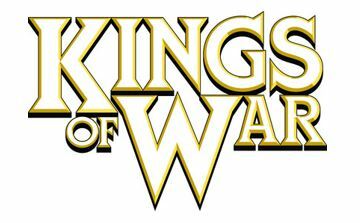 I am going to talk this time about a game of Kings of War that my son Oscar and I played. I have found that giving a younger player as much choice as possible in gaming is a good way to make them feel invested in the game. The starting point for this was allowing Oscar to choose which two forces we should use for our battle. He decided we should use Varangur (the Kings of War equivalent to Warriors of Chaos), and Dwarfs. He would nominally be commanding the Varangur, which are his favourite models. The next step was deciding how large a game to play. In the interests of keeping things manageable, and because I am due to be playing an escalation series with club mates, I decided that 750 points would be fine. I decided I should choose the forces, so they would fit into the required structure. I did however try to include fun units, while maintaining some list balance. A simple ‘kill’ scenario can lead to somewhat bland brawls in the centre of the table in many games. For this reason, I decided to ad-hoc a ‘take and hold’ objective on the centre line. This would give us both a bit of a focus, and get Oscar off on the right foot for objective based gaming. 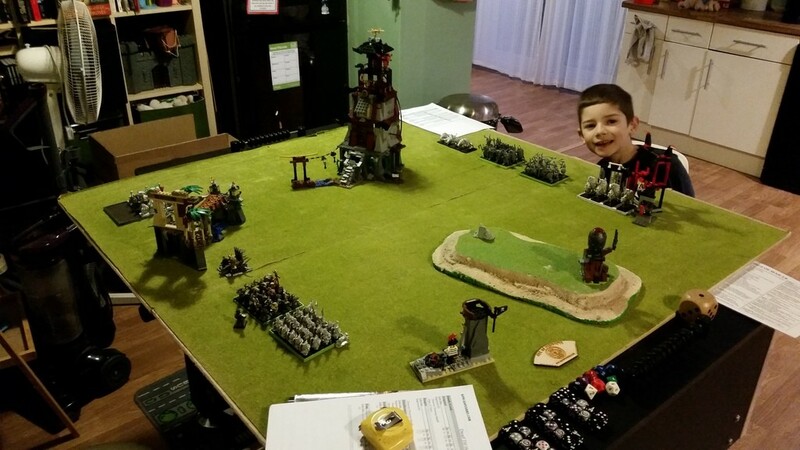 For scenery, Oscar had been using the 4ft square gaming board for playing with his Lego Ninjago, and as he had several buildings on the table already, we decided to just use those! All I added was a hill. It was fine using the Lego buildings as in Kings of War units do not enter buildings. 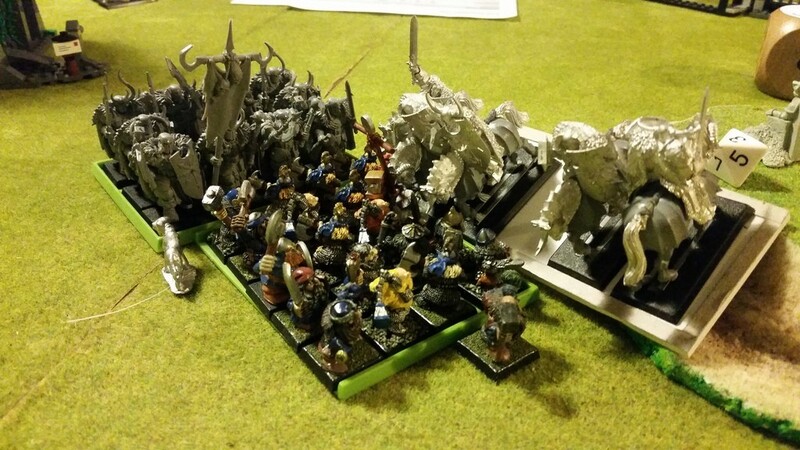 The units I selected for the Dwarfs were a regiment of Rangers, a regiment of Iron Guard, a regiment of Shield Breakers, an Organ Gun and a Dwarf King. The Varangur were comprised of a troop of Tundra Wolves, a troop of Mounted Sons of Korgaan, a Warband regiment, and a Blood Sworn regiment. The force was led into battle by a Chieftain mounted on a warhorse. I hadn’t included models with any casting abilities for either side, which was partly due to the small game size. It also helped for Oscar’s first game to have one less thing to think about. I only included minimal artefacts. For Varangur units that could have it, I gave them the Mark of the Reaper, including the Chieftain. All the Dwarf units that could take them had Dwarf Throwing Mastiffs. I should also perhaps mention now that the entire Varangur army is unpainted, because it is my new painting project for the next couple of months! I expected that in order to play this game through without losing Oscar’s interest in finishing it, we may be playing in bursts. We had set up somewhere where could leave the game out over several days if need be. This allowed us to play one or two turns, before leaving off for a while. I found that this avoided either of us getting tired of playing. It also gave Oscar something to look forward to after school, as he would come home and we could play another turn as I finished work. I wanted to allow Oscar as much input into the actions of the units as possible. I also needed to consider what the likely outcome of those decisions would be. This was to try to ensure that units weren’t making overly inappropriate moves. I did however allow our movement of units to be a little more ‘gung-ho’ than normal, as too much hanging back and jockeying for position might get boring. Each turn we reminded ourselves of what the armies were trying to do; control the objective. This gave a focus to our move planning, and made us think about where units would need to be over the remaining game turns. Oscar is nearly seven years old. He can understand a lot, but it would be foolish of me to expect him to be able to take in all the various game rules. What we did instead, was go through each turn phase one by one, and work together to measure movement and roll dice. Measuring movement and choosing a direction of travel was fine. What was more complex was considering how the facing of a unit would affect it. This is because in Kings of War, unit facing is critical. Games are won and lost on a few degrees of variation in the facing of units, and their exact positioning. This is because it will impact what they can see, and where they can be charged. Oscar and I had a discussion about unit formations in simple terms. We talked about how units in Kings of War have a front, sides, and a rear. Oscar and I went through understanding that units can do a lot more damage to the enemy if they can charge them in the side or the back. We also discussed how units should do everything they can not to leave their flank or rear open to a charge when they moved. I felt that Oscar took all of this in very well. What I didn’t do was leave Oscar to position units himself. I allowed him to move the units, but if necessary I would pivot the unit to a safe angle. I could have simply ignored facing to some extent. Given however that positioning is such an important part of the game, and a skill that every player must learn, I decided it would be better to play the rules as they are, but deal with this potentially tricky element by tweaking unit positions once they had moved. I plan for Oscar to learn to position units himself as we play more games together. I think at the moment for Oscar it’s enough to understand that units have facings, and being charged in the flank or rear is bad. I feel that overall the game played out well. We made sure we had reference sheets available, and a list for each of the armies. I asked Oscar throughout to check the stats and dice rolls required against the sheets, and he was happy to do the majority of the dice rolling. This kept Oscar involved in what was going on, and will help him to get used to handling large numbers of dice. He is also learning simple gaming etiquette, like removing missed dice and leaving the hits on the table. I am sure that little things like this will stand him in good stead in the future. We certainly saw plenty of cut and thrust on the table! 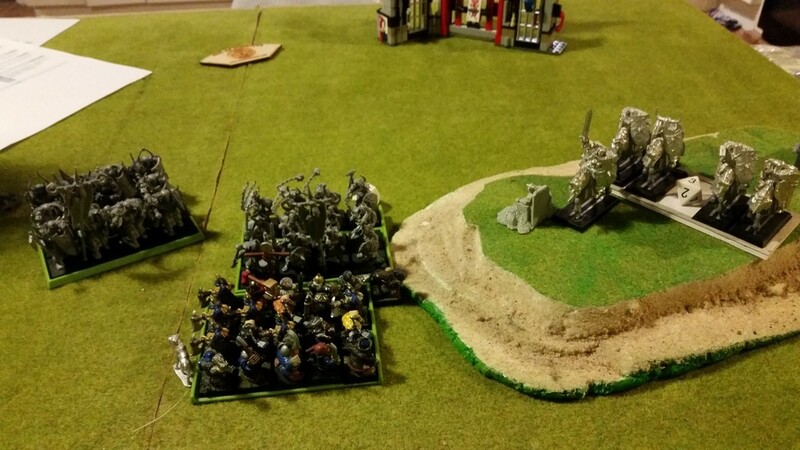 The Dwarf Rangers got ahead early on towards the objective with their Vanguard move. This gave them control of the objective at the end of their first move. It also put them on the hill so they could shoot at the Sons and Blood Sworn with their crossbows. Unfortunately this left them a little out on a limb. The Rangers peppered the enemy with quarrels. They were then charged and routed by the Sons on an unlikely nerve test result. This put the Sons and the Chieftain on the hilltop. The Warband, having been shot by the Rangers (being the easiest unit for the Rangers to hurt) were smashed in a single charge by the Shield Breakers. The Blood Sworn had to put up with several turns of being pelted with heavy shot by the Organ Gun, which slowly piled on the damage. The Blood Sworn however didn’t break before they got their chance to hit the Shield Breakers in the flank, while the Mounted Sons hit them in the front. The Organ Gun crew turned their attention to the mounted Sons once they had crested the hill. You may ask ‘where on earth were the heavily armoured Iron Guard’? I am sure the Dwarf King was asking the very same, as he found himself surrounded. They were on the opposite side of the large tower being led a merry dance by the Tundra Wolves. The Wolves proved yet again how important speed and manoeuvrability is in Kings of War. Speed allows an army to dictate the match ups, and when combats will take place. It can be very hard for an army if they can’t catch up with their enemy. Even Tundra Wolves can hurt Iron Guard with a flank or rear charge. Unfortunately with the Wolves able to stay at a safe distance, the Iron Guard had to make some tough decisions. 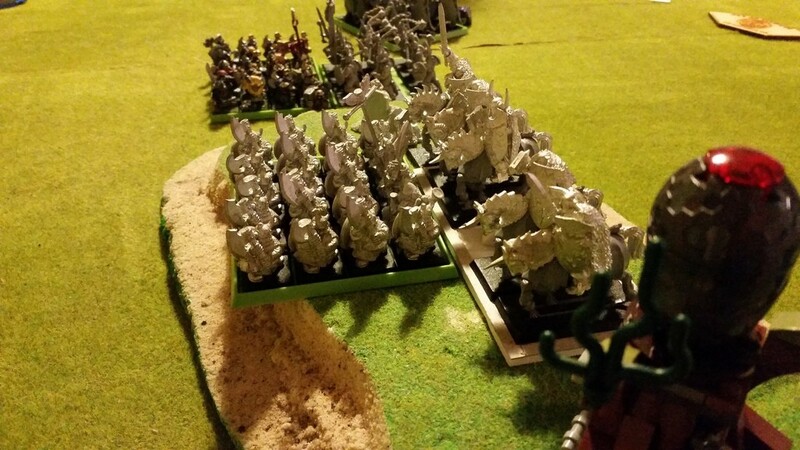 They were forced eventually, in order to get to where the action was, to give a flank to the Tundra Wolves, and then Counter Charge. The mounted Sons and Blood Sworn had already defeated the Shield Breakers. The Iron Guard needed to crush the Wolves in order to be able to turn and face the approaching Sons. The dice were against the Dwarfs, and the Tundra Wolves survived the charge. The Iron Guard’s gamble that they could defeat the Wolves, and then spin back around to face the Mounted Sons had failed, and they were charged in the rear and routed. The Sons overran the Organ Gun following turn, while the regiment of Blood Sworn took the hill and the objective. Our game was enjoyable, and I am sure we will play Kings of War again together before too long. I feel the biggest difference between playing this game versus the majority of others is unit positioning. Most of the other games we play have 360 degree facing for models. This means I can give Oscar more of a free hand in moving and positioning the models. It’ll be some time before Oscar has sufficient understanding to account for rigid arcs of sight and critical angles. Our next game will be a different system. Oscar has said he would like to try Blood Bowl, and also Bolt Action. The inclinations of a child are however difficult to predict, so who knows what we will play next! Whatever our next game is, I would like to allow Oscar more of a hand in choosing the force composition. I will also give him more control over movement and positioning of models. This will allow him to better understand the importance of where you place your miniatures. Nice article. Hopefully other parents out there are finding your advice useful; I know I would. I hope the benefit of the articles is that they are as honest as I can make them, based on experience. Every Child is going to be different, but there are things that we as adults take for granted that need a different approach when dealing with a youngster. I started playing Space Hulk with my nearly-six year old after digesting your last article. We started out just moving models around and rolling dice and have edged into actually trying to play missions. Today he wanted to play as Genestealers, but got bored and a little overwhelmed once he’d converted every blip into every model in the box, so he decided I was now the Genestealers and he’d be Marines. Sometimes just going with it is exactly what you need to do! The desire to want to play ‘properly’ comes with time, and a progression from the idea of simply playing with the models to playing the game. Absolutely. 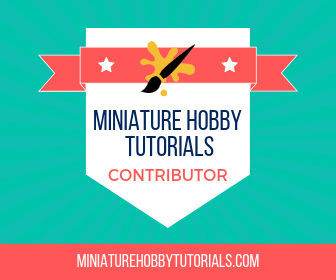 We play miniatures games alongside board games as well. As far as I am concerned, the more different games we play the better. I think Blood Bowl may be next for us!